The PML50 Series panel mount indicator with FlexVolt technology feature built-in ultra bright LED with a unique optical low profile lens. Provide uniform illumination and are designed for applications that require accurate recognition, regardless of external conditions. Achieve full brightness in microseconds – even in daylight viewing conditions. Designed for reliability in harsh environments, PML50 are built for unique performance and durability requirements necessary for a wide range of applications. The ruggedized PML50 Series FlexVoltTM indicator can be used with voltage ranging from 5V to 28V DC Circuits which reduces inventory cost and opens up unlimited design opportunities. 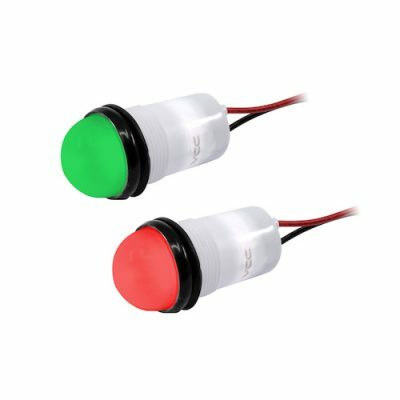 Available in five single colors: red, green, white, blue or yellow and in bi/color: red/green all offered with a clear lens for increased contrast between on and off. Click below to view the PML50 Product Video or click here to check out VCC’s YouTube Channel.